with each day bringing new discoveries, news oohs and aahs. What a magnificent season to walk the cultivated gardens and the natural areas, seeking both the brash and the modest — plants whose tropical colors take the chill off an April morning as well as the tiny, fleeting jewels only the fortunate will notice. Look and look again. These blooming plants dance in sequence, extending the impact of this treasured time. Certainly the big boys of spring are the flowering bulbs. The Garden has thousands and thousands of them — from eye-catching tall hybrid tulips (consider these beauties as annuals) to the true perennials in this group of bulbs, shorter plants whose petals open wide to the sun and whose foliage sports stripes or mottled markings. Tiny bulbs, such as pink and blue glory-of-the-snow, blue squill, along with grape hyacinth, are the reliable returners, which, after the excited first sightings of February snowdrops and yellow winter aconite, form rivers of color, swirling through beds, popping up in ground covers, or clustering at the feet of their taller and more conspicuous companions — the ornamental onions (Allium spp. ), fritillaries (Fritillaria spp. ), tulips (Tulipa spp. ), and daffodils (Narcissus spp.). Mixing diminutive with statuesque bulbs creates a constantly changing color wheel and adds a flurry of floral drama. Most certainly, the highly anticipated appearance of 65 English garden troughs in the Heritage Garden signals spring’s debut! These hypertufa containers overflow with inspirational combinations of tulips, cool-seasonal annuals, and wildflowers in a six-week showcase display. Careful thought is given to sequencing bloom time plus the impact of shifting colors and textures, since the plants must maintain their appeal through the end of May. Each container is a garden in miniature, filled with surprises and inviting combinations. Highlights include: Juncus Effusus 'Spiralis Twister', Linaria Maroccana 'Fantasy Yellow', Nemesia Strumosa 'Spicy Orange With Pink Eye', Tulipa 'Lady Jane', and Tulipa Vvedenskyi 'Tangerine Beauty'. Another wildflower from out of state is the beloved Texas bluebonnet (Lupinus texensis), one of six species of lupines that represent the state flowers of Texas. 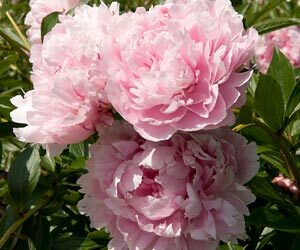 Their clusters of dark blue, fragrant flowers can sometimes reach 50 in number on a single stem. Blue, in all its hues, is a prized color in the garden, and flowers in these tones are used profusely as accents to the jeweled bulbs. 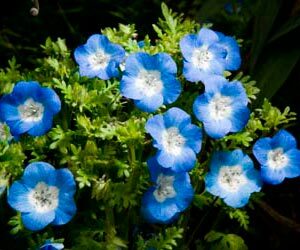 Masses of baby blue-eyes (Nemophila maculata), another California wildflower, feature lilac blue flowers with purple spots on their petal tips. Brilliant dark blue-to-purple phlox (Phlox drummondi) can be used to advantage in both containers and garden beds, where their foamy forms serve as beautiful lower layers to taller bulbs. The shocking, electric blue felicia (Felicia heterophylla) is most likely the bluest of the blues, and no, those daisylike flowers have not been chemically colored! Always a standout in any spring window box or container are the peony wannabes, the Persian buttercups (Ranunculus asiaticus), whose tightly coiled petals mimic peonies, but in raspberry, orange, and cream. Charming perennial tulips (Tulipa batalini ‘Bronze Charm’) warm the day with sunny yellow petals feathered in bronze. Another wildly popular perennial tulip, Tulipa bakeri ‘Lilac Wonder’, blooms lilac pink with yellow poached-egg centers. 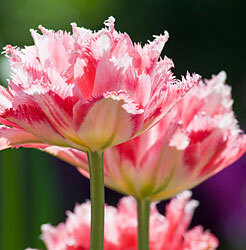 At 6 to 8 inches, these tulips may be short in stature, but their impact is pure delight. A fantasy of white and yellow spurred snapdragons (Linaria marocanna) keep blooming throughout the cool spring weather, often continuing their flower power well into summer. These annuals are available in other colors, too, and their frothy looks blend well with all companions. What would spring be without pansies? The sweet star of the troughs is Free-Flowering, a lovable orange viola. In the more formal, full-sun Circle Garden, curving beds give way to geometric squares and rectangles. A living kaleidoscope of color, the Circle Garden offers some exceptional plant combinations in this April and further into spring. Look for the spectacular colors of tulips in shades of yellow, pink, and red. On either side of the central fountain, find deep purple tulips alongside fritiallaries, narcissus, and bright gladioli. 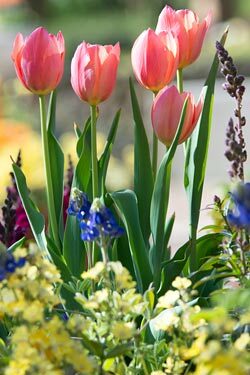 Two "secret" gardens offer blends of colored tulips underplanted with delightful muscari. Outlining the garden's circular space are primulas, narcissus, viola, and linaria. The design of the Regenstein Fruit & Vegetable Garden is meant to showcase what can be grown in the Chicago area. Every annual plant grown there is somehow edible — even the diminutive blossoms of sweet alyssum — but more importantly, they are an early source of nectar and pollen for the Garden’s resident honey bees. The colors of spring light up each garden space daily with new life and wonder. Every display bed, hillside, native habitat, and hanging basket bloom with the best this season can offer. The Garden has more than two million plants in its collections. Don’t miss these magical moments as form and fragrance, color and texture return to all the gardens. Wellness programming is generously supported by NorthShore University HealthSystem.